Guitar phenomenon Michael Angelo Batio was in a dilemma. He is twice the guitarist, and he plays twice the guitar. But he didn't have twice the overdrive he needed to keep up with his blistering licks and double-handed pyrotechnics. That's why he teamed up with Denmark's T-Rex Engineering, a producer of high-end and custom effects pedals, to create Michael Angelo Batio Overdrive. You only have to listen to Mr. Batio play to hear what this pedal can do, add an exquisite overdrive to your guitar sound. 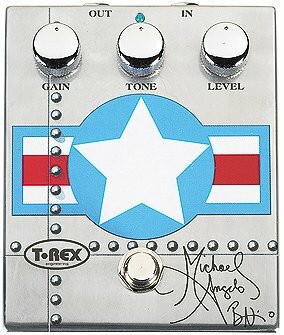 Michael Angelo wanted a pedal that would give him creamy, classic overdrive without clouding his unique touch and tone. T-Rex produced an overdrive unit with a sound sweet enough to make an angel cry, but with an earthy bite and punch! From a medium blues crunch to a rock guitar wail, Michael Angelo overdrive covers the full spectrum of overdrive distortion. Let there be no doubt: the Michael Angelo Batio Overdrive was created for this guitarist and his brand of melodic heavy rock, moody, moving, majestic. But the core of this pedal is a warm, natural-sounding smooth distortion that will appeal to any guitarist looking for the holy grail of overdrive. Gain, Tone and Level knobs, input and output jacks, 9-12 V DC or 9 V battery, industrial design with metal finish, Michael Angelo Batio's logo and signature.